This year’s school-wide Thanksgiving Potluck is just a week and a half away. 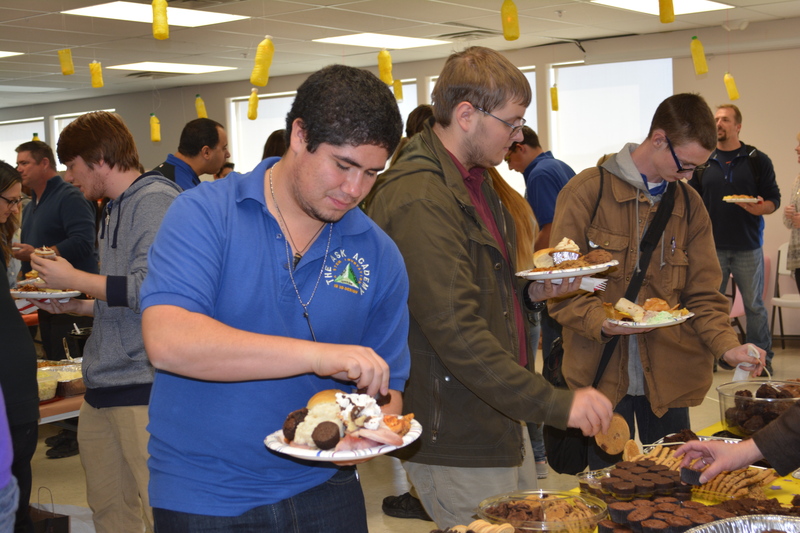 Scholars and managers come together and have a grand feast on the last day before Thanksgiving Break. Career Pathways and Fundamental Connections class is assigned a dish or utensil to bring with them next Tuesday, November 22.. Hot foods are required to be brought at 10:30 a.m. Please note, this is a school function only, we request that you do not invite additional family members to come eat with you. Photos by Paige Fairchild — Last year’s ASK Academy Thanksgiving Pot Luck. Many have noticed that this potluck will be structured differently due to the growth of scholars since last year, meaning that middle school and high school will be eating separately. Middle School will be eating first at 11:24 a.m. to 12:15 p.m. High School will eat from 12:32 p.m. to 1:20 p.m..
A flyer should have been passed out last Thursday in Career Pathways or Fundamental Connections; the list is below as well. Side Dishes- Cooked Vegetables, Salads, ect.